We have a Potain HDT80 on a Salisbury Building Project for a hire period that is projected to last for over one year. The project involves a redevelopment of the site and grade II listed buildings at the Old Manor Hospital in Salisbury. 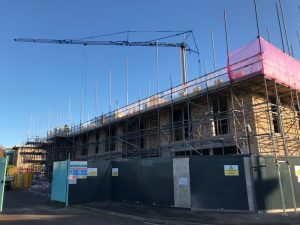 It will provide 56 assisted living extra care dwellings comprising of 22 two- and 4 three-bedroom houses along with 5 one- and 25 two-bedroom flats with access, parking and landscaping following demolition works. 6,000kg closer to the tower. We are inundated with requests for this particular model of crane due to the ease with which it can be placed on site and the capacities that it offers. It is one of the the most popular cranes on our Hire Fleet which also includes the Mantis 35.10, Potain HUP 4030, Mantis TC 25 and Potain T85A among others. We also provide a wide range of City Tower Cranes.